What's New In LPIC-1 and LPIC-2? 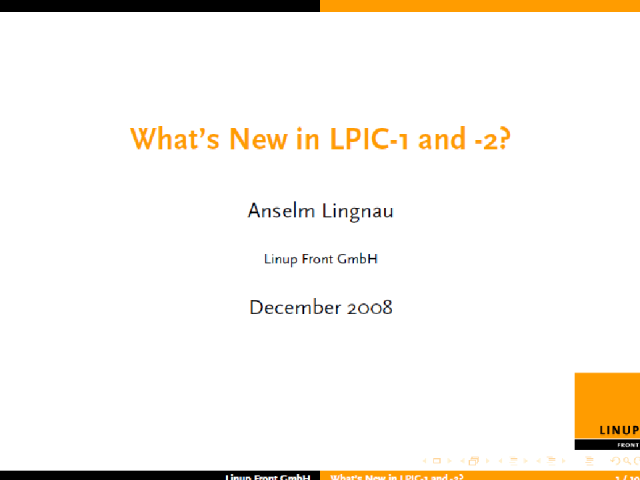 ANSELM LINGNAU will be discussing the new versions of LPIC-1 and LPIC-2 exams that will be out in April 2009. Front GmbH, a leading German provider of LPI-ATM certified training materials and instructor services as well as Linux and Open Source consulting. Based near Frankfurt, Germany, Anselm has been teaching Unix and Linux classes at all levels for more than 15 years and is the author of the first German-language LPIC-1 exam preparation book ("LPI Level 1", with publisher MITP) as well as the O'Reilly book, "LaTeX Hacks". Anselm also designed and implemented Linup Front's popular open-source LPIC exam simulator as well as "LPI Academy", a ground-breaking community web site that combines LPIC exam preparation with a wiki in order to offer a venue for LPIC candidates to get together, swap experiences and learn from each other. James Stanger, Chief Certification Architect for Certification Partners and Chairman of LPI's Strategic Advisory Council describes the value of vendor-neutral IT Certifications. He also provides an overview of LPI's certification program and its benefits to the IT professional. G.Matthew Rice, Director of Product Development at the Linux Professional Institute describes the open and transparent exam and certification development process at LPI. Matt will use LPI's recent experience with the development of the LPIC-3 program as an example. This webcast will describe the value of Linux certification in a competitive market for IT professionals. Title: What's New In LPIC-1 and LPIC-2?